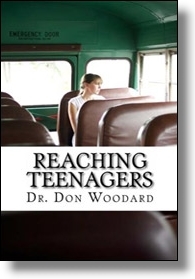 Reaching Teenagers by Dr. Don Woodard is the best book I have read in some time on the topic of effectively reaching our youth without compromising our stand. Dr. Woodard Traveled the U.S. For fifteen years as an evangelist encouraging churches to reach teens and, since 2008, has pastored at Beacon Baptist Church in Salem, VA.
His book discusses how to start a youth ministry, how to manage it, what safe-guards to put in place, and suggests many types of activities. This is a must-read book for any church desiring to start a youth ministry of any kind. The guidance offered in this book will save youth leaders and pastors many headaches and help jumpstart the ministry to teens.